La plejparte de la generacio kiu spertis la dua mondmilito kaj tre suferis dum ĝi nun estas mortinta, kaj do la nuntempa homoj de Usono, Eŭropo, kaj eĉ Azio ne komprenas la graveco de tia milito kaj la teruran suferon kion ĝi okazigas. Mi scias, ke miaj pensoj pri ĉi tio ne estas tre originalaj, sed ili nepre estas tre bezonataj nuntempe, kaj devas esti laŭte proklamataj per ĉiuj, kiuj amas la pacon. Ni memoru la antaŭajn mondmilitojn kaj neniam ripetu ilin! Ĉiu, kiun interesas internaciaj rilatoj, bone scias la danĝeron, kion ni nuntempe alfrontas. Ekzemple, Rusio lastatempe aneksis parton de Ukrainio kaj la usona prezidanto retiriĝis el la akordo kun Irano kontraŭ ĝia akiro de nukleaj armiloj dum la Unuiĝinta Reĝlando pretiĝas – aŭ nepretiĝante disputas – eliri el la Eŭropa Unio. Eĉ en multaj ŝtatoj de la Eŭropa Unio, kaj ankaŭ Usono kaj aliaj landoj, naskiĝas naciismo batalante kontraŭ la institucioj kiujn oni fondis pro evito de militoj post la dua mondmilito. Dume, Ĉinio minacadas Tajvanon, kaj Ĉinio kaj Rusio ambaŭ fabrikas pli malgrandajn nukleajn armilojn, farante ke estus pli facile decidi uzi ilin dum milito. Verŝajne ni ne bone komprenas la riskon de alia mondmilito, nek kiom ni suferus dum tia milito. Se ni pli bone scius la historian de la unua kaj dua mondmilitoj, kaj la motivoj pro kiuj ni faris instituciojn kiel la Unuiĝintaj Nacioj, ni nepre skuiĝus kaj timus la estontecon! Mi kredas, ke paco en la mondo estas neevitebla, sed mi ne scias, kiom da fojoj ni devos denove lerni la teruran lecionon pri la milito. Se ni rifuzas lerni ĝin de la historio, ni devos lerni ĝin per la sperto. Laŭ mi, estus pli saĝe lerni de la historio. Kie estas la pacifistoj en nia tempo? Ili bezonas pli fortan voĉon. Ni bezonas, ke ili havu pli fortan voĉon! Mi ŝatus vidi pli grandan kaj laŭtan pacmovadon en Esperantujo, kaj ne nur en Esperantujo, sed inter ĉiuj popoloj. Mi estus tre feliĉa se Esperantistoj estus grava parto de nova aŭ pli granda tutmonda pacmovado. Paco ja estas en la DNA de Esperanto. Saĝa homo – eĉ profeto, laŭ mi – iam diris: “Kiel ĉarmaj estas sur la montoj la piedoj de anoncanto, kiu proklamas pacon….” Proklamu ni pacon, kaj estu ĉarmaj kaj belaj niaj piedoj sur la montoj. Tiu Dio, kiu kreis la homaron, benu nin per ĉarmaj piedoj; mi ne kredas, ke li kreis la homaron, por ke ili estu eterne batalantaj. Mi timas, ke ni ne estas konscia de kiel proksime ni estas de tria mondmilito. Ŝajnas, ke tio ne gravas al ni, ĉar ni nur konas la militon pere de la televidilo. Ni tuj devas vekiĝi; alimaniere ni lernos ami la pacon per la teruraj konsekvencoj de la malamo, kaj nur restaĵo de ni aŭ nia ido restos post la dolora leciono por vidi la neeviteblan pacon. Ne devas esti tiel. Ni povas ŝanĝi. Ni povas elekti la pacon. Ni povas trovi, ke fremlandanoj estas niaj fratoj, kaj ne devas esti malamikoj. Sed mi supozas, ke la esperantistoj jam scias tion. Hieraŭ mi ĉeestis la kunvenon de GLADIVS, la klubo de latinistoj ĉe San Diego. Ni legis kune parton de la tragedio “Medea” de Seneko. Mi devas konfesi, ke mi trovis ĝin tre malfacila, kaj la aliaj latinistoj klarigis al mi multajn aferojn, kiujn mi ne komprenis. Mi ne estas komencanta latinisto, do mi estis surprizita, ke la verko estis tiel malfacila! Laŭ la tragedio, Medea estis la edzino de Jazono, la heroo de la helena mitologio, sed Jazono forlasis ŝin por edzinigi al si Kreusan, la filino de la reĝo Kreono. Medea kompreneble koleregis pri tio, kaj (eble ne tiel kompreneble) mortigis kaj Kreonon kaj lian filinon. Poste, Medea serĉas pli da venĝado kontraŭ Jazono. Mi pensas, ke ŝi mortigis ankaŭ ilian filon—t.e. la filo de Medea mem kaj Jazono—sed mi bezonas legi la tutan verkon. Mi ŝategis legi malgrandan parton de la verko kun la latinistoj, kaj nun mi volas skribi iomete en Esperanto pri la klasika literaturo, kaj eble fari (sendube malbonajn) tradukojn de iuj verkoj. Mi esperas, ke tio plibonigos mian fluecon kaj en latino kaj en Esperanto. 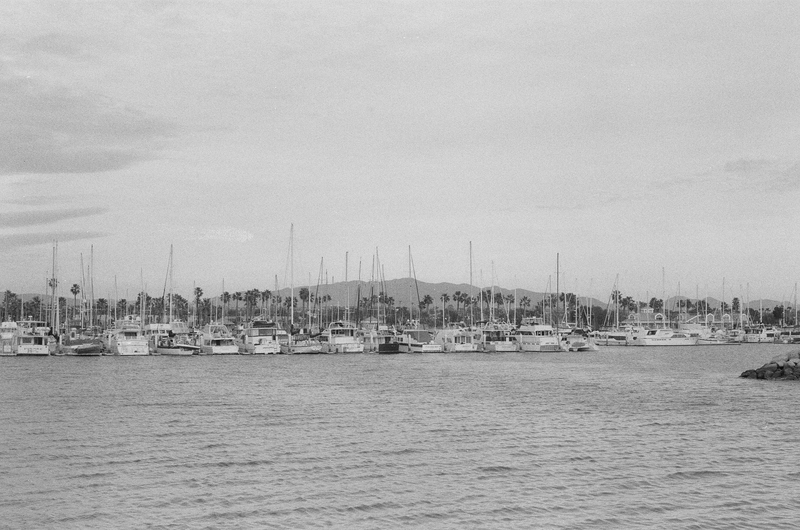 Looking toward Otay Mountain from the Chula Vista Bayfront Park, overexposed two stops. Recently upon shooting the last frame of a roll of Kodak Ektar 100, I put a roll of Ilford HP5 Plus — my second roll of HP5 Plus, and my third roll of black and white film — into my Pentax K1000 and began shooting. After about five shots, I realized that I hadn’t adjusted the camera’s ASA setting, so I had overexposed those five shots by about two stops. When I received the prints back after processing, the subject matter of those first five shots was distinct and clear despite the overexposure. They had noticeably more grain than the other shots, but that was their primary deficiency. I underexposed another shot in the roll by about two stops. A boat was going by, carrying passengers from downtown San Diego to Coronado. A marker post and a dock were nearby, and I thought it would be an interesting composition if I could line them up to point at the boat. Time was short, however, since the boat continued moving along as I tried to sort out the scene. In my rush, I screwed up both the metering and the composition. I needed about two stops more light in the camera, and I needed to be up a little higher. Nonetheless, the film did its job, and despite a little extra grain, the scene came out clear. You can count the windows in the buildings across the bay, if you so desire. 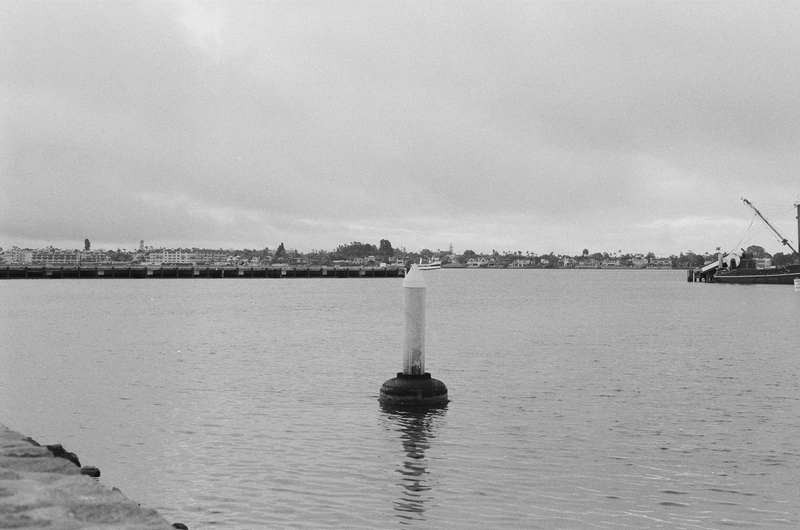 Apparently, Ilford’s HP5 Plus is pretty generous about exposure. I don’t know yet whether — or to what degree — other black and white films are so generous. As for the properly exposed shots, what can I say? I have been very pleased with the results. Upon receipt of the first set of prints, I was sold on black and white photography. I won’t be shooting black and white exclusively, but I’ll generally keep a roll of black and white on hand. I grew up in a world of color. Between color film, color TV, and color computers, color was the norm. Even old black and white movies were occasionally colorized, though I realized early on that the colorization rarely added much, if anything, to the enjoyment of the movie. As I was growing up, I was exposed to monochrome computers, which were still in use in schools. I enjoyed the green and black screens of the old Apple IIe computers. I also enjoyed some old black and white TV programs. I even enjoyed the occasional black and white photograph. But color was the standard, and I never took black and white too seriously. That attitude was changing slowly, but my interest in film photography was a catalyst that made an abrupt and immediate difference. 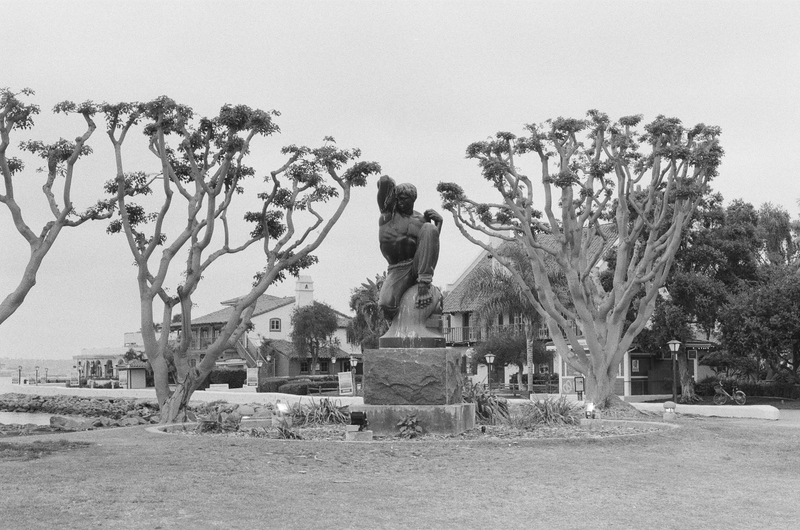 A statue at Embarcadero Park: “Morning” by Donal Hord, framed by two trees. Color adds a lot to certain photographs. But color can also be a distraction. It can influence where your attention is directed in a photograph, and it sometimes does so in good ways, and sometimes in bad ways. Occasionally it’s nice to take away that distraction and force the viewer to consider other attributes of the elements in the photograph. And sometimes it’s good for the photographer to take a moment and compose a photograph with the different considerations that black and white imposes. You might benefit by asking yourself, upon seeing a black and white photograph, what color would add to it. Maybe the photograph would benefit from being in color. I think the conclusion will often be that color wouldn’t add anything substantial, and, in fact, that the photograph would lose some of its charm if it were in color. I confess that I have a photograph or two that I wish I had taken in black and white. Sure, I could convert it to monochrome in Photoshop (or the Gimp), but it wouldn’t be the same. Besides, I generally avoid making material changes to my photographs on the computer. I like color. As I stated above, I will continue photographing in color. But black and white will also be part of my repertoire from now on. Given that beauty has an objective existence, and with the added premise that it exists in the world around us, I set out to capture it on the medium of silver halide crystals in a gelatin emulsion on a strip of plastic. 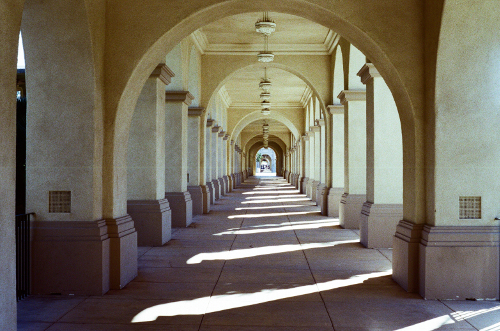 Or, more to the point: 35mm film. Admittedly, I have enjoyed taking some Polaroid pictures also — both with my old OneStep Express and with the new OneStep 2 — but in somewhat fewer numbers because Polaroid film is expensive! I chose film as my medium in order to slow myself down and teach myself patience. I also chose it because my early experiences with film, all of which took place with cheap consumer cameras, failed to result in clear pictures. It would have been easy and, in a sense, liberating to buy and use a DSLR camera. I chose constraints, limitations. This project had to be a challenge if it was going to be worth anything. The choice has certainly paid off. From the time I purchased my first digital camera (probably around the year 2003 or 2004), I was able to effortlessly take clear photos and see the results immediately. I have captured some memorable moments, but I’ve never taken digital files to the store to get prints, and I’ve rarely gone back to look at the photos. 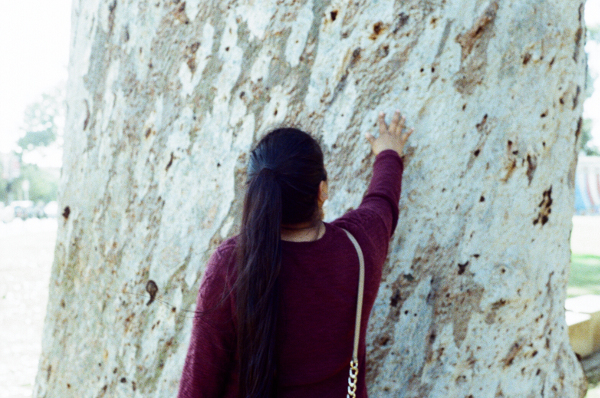 I’ve spent more time looking through my old blurry film photographs than my digital ones. The ease of taking the photographs seems to have diminished their value to me. On the other hand, I experience a real feeling of excitement opening up the prints from my latest roll and a real sense of joy when at least some of the photos come out well. Those photos are accomplishments, and I value them so much more for what went into them. Some have stated that the medium is meaningless; only the results matter. That’s a sensible position to take in a culture of consumerism. The photographer is just another sort of factory worker. Just as we don’t care about the overworked Chinese person who attached the screen to your iPhone before jumping to his death from the roof of the Foxconn building, the photographer doesn’t matter to us, nor the experiences that went into making the photograph. Luckily, I’m not taking photos for consumers. I take photographs for the experience as well as the results. Those experiences, including the choice of film as my medium, are meaningful to me. I’m posting daily to Instagram, but I plan to put the occasional wordier post up here with thoughts related to a photo, or the story behind it.